Chinese officials Monday expressed their strong disapproval over Japan permitting a visit by a Uygur separatist this week. Rebiya Kadeer, leader of World Uyghur Congress who the government believes was behind the July 5 riot in Xinjiang and a series of protests at Chinese embassies worldwide, is scheduled to visit Japan today. She plans to give a news conference on Wednesday and deliver a speech to Japanese citizens, Japanese media reported. Japan has issued a visa to Kadeer, according to officials from Japan's Ministry of Foreign Affairs, media reported. "We are extremely dissatisfied that the Japanese government, in disregard of China's repeated protests, insisted on allowing Kadeer to visit Japan to carry out anti-China, separatist activities," Foreign Ministry spokesman Qin Gang said yesterday. On the same day, China's ambassador to Japan, Cui Tiankai, denounced Kadeer's visit. 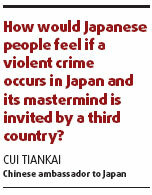 "How would Japanese people feel if a violent crime occurs in Japan and its mastermind is invited by a third country?" Japan's Kyodo news agency quoted Cui as saying. Calling Kadeer a "criminal", Cui warned that Kadeer's visit should not be allowed to damage Sino-Japanese relations. "There are many important matters for the two governments," Kyodo quoted Cui as saying. "We must prevent bilateral relations from being disturbed by a criminal." Unlike Japan, India has denied a visa to Kadeer, who wanted to meet Indians sympathetic to her movement, the Indian newspaper the Telegraph reported on Saturday. She had applied to the Indian embassy in Germany for a visa sometime early this year, before the July riot. "We have an understanding with the Chinese government that we will not allow Indian soil to be used for political activities against China," the newspaper quoted an Indian senior official as saying. Kadeer, who lives in the US, aims to use her Japan visit to garner international support and bring pressure to the Chinese government, said Liu Jiangyong, a scholar on Asian studies at Tsinghua University. "Her visit to Japan is an organized move with a political purpose. She seeks to make a breakthrough in Japan, which neighbors China," Jiang said. Jin Canrong, deputy dean of International Studies School at China's Renmin University, said Japan allowing Kadeer to visit is an "extremely unfriendly" move towards China. "Japanese officials worry that their citizens will think they are weak if they deny Kadeer's visit. But more importantly, they did so to meet the country's need to restrain China's rise," Jin said.